iOS 12 has a long-awaited "Digital Health" suite of enhancements, which along with other tweaks will greatly help users live a less stressful digital life. 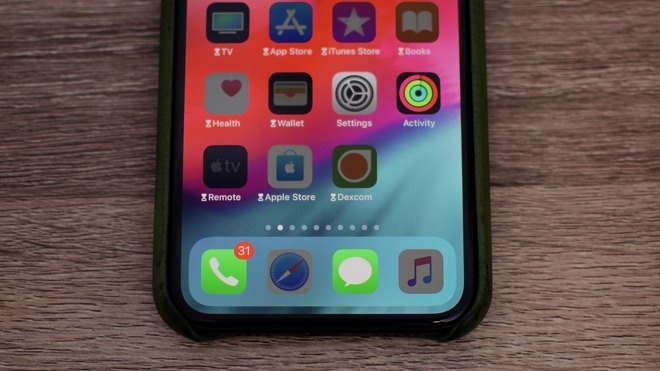 AppleInsider delves into all of iOS 12's quality of life improvements, and talks about how they'll help the iPhone-addicted. The most prominent of the new features is Screen Time. Screen Time has several different facets, but for the majority of users it will give them insights into how much they are using their devices, where they spend the most time, and provides tools to help to reduce their usage overall. Inside of the settings app, a new section for Screen Time helps get everything set up. On top is a high-level overview of the current day's usage. It splits it up between categories such as Health & Fitness, Productivity, Entertainment, and others. Jumping into that mini widget shows a much more granular view. The widget shows sessions lengths, most used categories, how many times the phone is picked up broken out per hour and in total, and how may notifications come in and from what apps. Seeing some of these numbers may help encourage users to put their phones down and have less screen time. To help keep iPhone use time down, there is a specific category of Screen Time known as Downtime. This can be used to only allow certain apps to be accessed during times that the user wants to wind down, and get ready for bed. During these Downtime hours, if an app is opened that isn't white-listed, an alert will appear letting the user know that access is restricted. Apple's approach to this for individual users, however, is very laissez-faire. Users can still ignore this limit with a single tap. After that tap, Screen Time will prompt them again in either 15 minutes to give it a rest, or it will ignore the limit the rest of the day. All apps that are off limits during downtime will be darkened, with an hourglass icon pointing out the restriction. For parents, App Limits can be configured on a child's device to keep tabs on what the kid is doing, and what sites are being visited on the web through Family Sharing. Yes, every website. Given the trio of responsible and involved parenting, existing limitations in the Restrictions preference pane, and Screen Time, for the first time on iOS parents can have granular control and monitoring of the device spanning from no access to the internet at all to a completely unbound device. Notifications got a huge makeover in iOS 12. They are finally able to be grouped together, making dealing with notifications quicker, and much less stressful. Users can use Instant Tuning to adjust their notifications on the fly too. When a notification comes in, a swipe to the left, and a tap on Manage brings up Instant Tuning controls. Without ever touching the Settings app, notifications for an app can be turned off, or "Delivered Quietly". 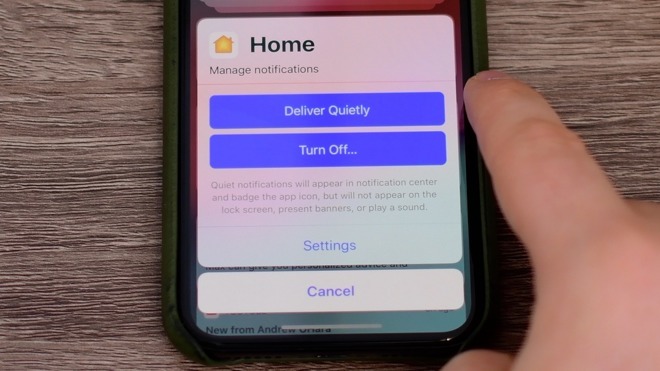 Deliver Quietly will send notifications to Notification Center, but won't alert you on the screen. This is handy for things that users want to keep track of, but don't need to be bothered with constantly. Another new improvement is Bedtime mode. 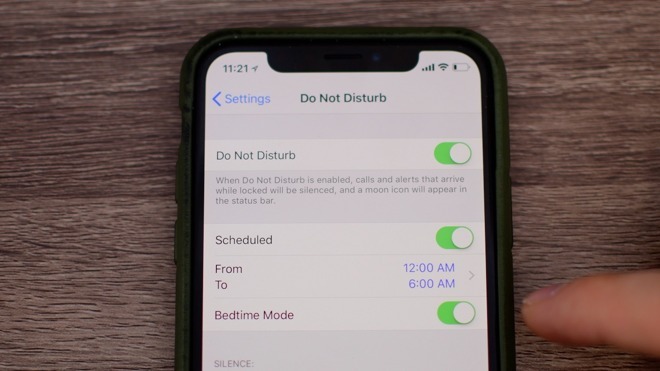 Bedtime mode will help ease users back into notifications as they wake up. 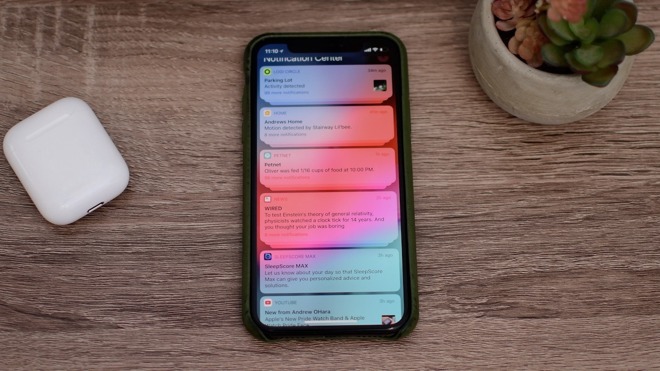 Notifications that are delivered overnight in Do Not Disturb mode will be delivered quietly into Notification Center, leaving the lock screen empty in the A.M.
With iOS 12, there is need to start the day stressed out by a barrage of emails, Twitter alerts, and more right out of the gate. Deal with them on your own time, and in your own way. A new feature added to Siri is trying to assist your digital life even more. 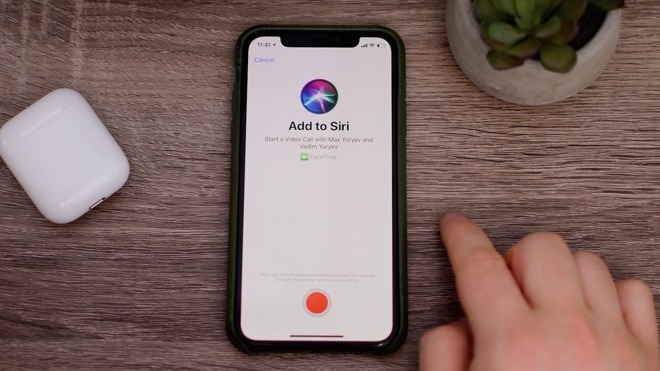 Siri Shortcuts are quick actions that Siri can perform for users, making interactions quicker and easier. Shortcuts come from two locations —they can be set up directly within apps once developers update with support for iOS 12, or be created from scratch by the user. Soon, a new Shortcuts app will be released that helps users create their own and gives inspiration through popular "recipes" of tasks. "Siri, I'm leaving" could start the car, lock the door, turn off the lights, and adjust the thermostat. "Siri, find my keys" could trigger your Tile tracker to ring. "Siri, I had another cup of coffee" could log the caffeine in the health app. "Siri, feed my dog" could dispense food from your HomeKit pet feeder. "Siri, get me home" could book an Uber and text your family you're on your way back. 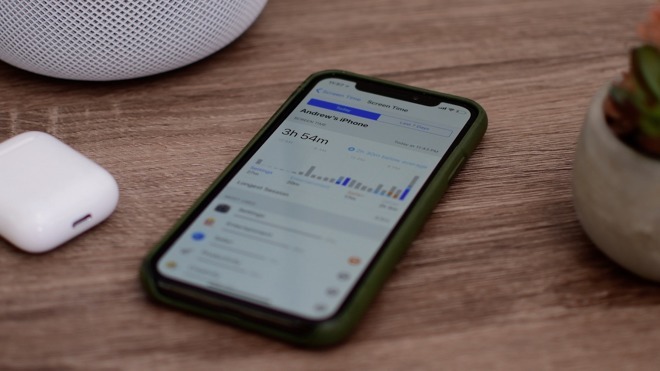 Apple says that Shortcuts users will be able to download 1,100 already composed solutions for problems. While we're not sure if users will be able to share Shortcuts with other iPhone owners, the available pool should rapidly grow as app developers chime in on the subject. iOS 12 also has a number of small improvements to cut back on some long-standing user difficulties. Everybody has tried to search for a song by lyrics without knowing the title. 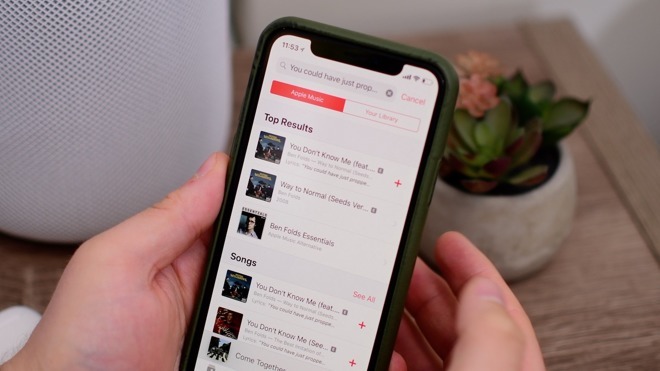 Instead of trying to Google it, lyrics can be searched right within Music. Face ID users are now able to rescan quickly if it fails to authenticate. Now, just a simple swipe will rescan Face ID, granting access to the phone. Much easier for users. One-time passwords, which can often be as annoying as much as they are useful, are now auto-suggested by the QuickType keyboard. The quick retrieval makes easier to gain access to secure apps and websites. Of course, one of the biggest improvements is faster speed overall. Opening the Share Sheet, launching the camera, and opening apps are all noticeably quicker throughout iOS 12 on both new and old hardware. This again makes the whole user experience smoother, faster, and enjoyable for the user —and AppleInsider will be talking about this more in the days to come. Apple took the right approach to the problem. Instead of forcing limits on an adult's device, or making the user jump through hoops to bypass a limit, they are skippable with little effort and easily tailorable. Of course, success of these features for any given user relies on that same user realizing that they, themselves established the limits on the phone for a reason. Plus, in the case of Siri's Shortcuts, they need to be properly configured and customized first to be a help and not a hindrance to the user. The data that Apple provides is more than enough to give the user information to make informed judgements about device usage, making it a good tool. But, any good tool loses practicality if wielded improperly, or ignored. This won't help the "five more minutes" crowd, or the "got to check the 2AM email from the boss" types who will keep tapping to ignore a limit even in the dark of night. So, like maintaining the discipline for daily work-outs that Apple facilitated with the Apple Watch, the user has to be an active, and willing, participant in the process.